Penguins are flightless birds belonging to the family Spheniscidae. World-wide there are 17 species of penguin, all of which breed in the Southern hemisphere. The name is believed to have originated from the Welsh "pen gwyn" which means white head. The name was originally applied to Great Auks, which are flightless birds that lived in the northern hemisphere, before being hunted to extinction in the 19th Century. Great Auks looked similar to penguins, and were also unable to fly, which is why they were killed off so easily by sailors who used them for food. Penguins differ from birds which are able to fly, by having a much heavier and more robust skeleton. Birds that fly must have a skeleton which is as light as possible, in order to make flight possible. This is achieved through bones that are paper-thin or hollow, often with internal honeycombing that combines adequate strength with low weight. For flying birds that also dive, such as Auks, this low density skeleton means that birds must work hard to overcome considerable natural buoyancy when diving below the water surface. For penguins that do not have the power of flight, such light weight skeletons hold no advantage, and they therefore have bones which are considerably denser, giving greater strength and reduced buoyancy. The penguin skeleton is also markedly different from other birds around the furcula and breast bone, due to the differing movement and muscular requirements of penguin flippers compared to bird wings. Such differences in bone structure provide vital clues to the ancestry of penguins, since bones are often the only parts that remain as fossils. The first penguin fossil to be discovered was that of Palaeeudyptes antarcticus, found in rocks that were around 25 million years old, in New Zealand during the 19th century. Since then penguin fossils have been found that date back around 50 million years, which show many of the typical features associated with modern penguins. No penguin fossils have ever been found in the northern hemisphere. The largest penguin ever to have been discovered was similar in size to a man. Despite a long evolutionary history, today's species have much in common. They mostly have blackish upperparts and whitish underparts on both the abdomen and flippers. This helps to camouflage the penguin against the lighter sky when viewed from below, and the darker waters when viewed from above, making them harder to spot by both predators and prey. The feathers are waterproof and interlocking, providing an effective barrier to water. Each feather has small muscles which allow them to be held tightly down against the body whilst swimming, to form a thin water proof layer. Little air is therefore trapped in the plumage when swimming, preventing excessive buoyancy which would hinder diving. When on land, these muscles hold the feathers erect, thereby trapping a thick layer of warm air to provide the best insulation against cold wind. The insulation provided by the plumage is further aided by thick fat deposits beneath the skin, and a counter-current blood supply to the exposed legs and feet. The blood vessels supplying warm blood to the legs and feet are surrounded by the vessels returning cooler blood back to the body, enabling much of the heat lost from the warm blood to be recovered. This vascular system is also able to severely restrict the amount of blood flowing to the flippers and feet, which may be kept as low as 6 Celsius despite a body core temperature of 39 Celsius. This considerably reduces the amount of heat lost during cold weather, but the process can also be reversed so as to aid heat loss during hot weather. Penguins also have a counter-current heat exchange system in the nasal passages, whereby air from inhalation and expiration are mixed in a common chamber. This allows recovery of much of the heat lost from the blood capillaries during respiration. This process can also be reversed to aid heat loss during periods of hot weather. Air is a poor conductor of heat, and adult penguins outside of the Antarctic are able to maintain their body temperatures on land without the need to increase metabolic activity. By contrast, water is a very effective conductor of heat, and despite their adaptations most penguins do rely on increased metabolic activity to maintain their body temperature at sea. In the comparatively warmer waters north of the Antarctic Convergence however, the increased metabolic activity resulting from swimming and foraging is sufficient to meet these needs. By comparison to adults, chicks have very different types of plumage, which serve completely different purposes. Newly hatched chicks have a protoptile plumage, which is very sparse, and provides inadequate insulation from the cold. However, at this period of development chicks do not require insulation, because they are brooded by the adult, and the sparse plumage enables rapid transfer of heat from the adult brood patch to the chick. Only when chicks near the end of the brood period, do they need a plumage with greater insulative properties. As chicks grow larger, and demand more food, it is necessary for both adults to go to sea to forage. Prior to being left by both adults, chicks grow a thick, fluffy plumage called the mesoptile plumage, which traps a thick layer of air and provides excellent insulation. This plumage provides better insulation against cold wind than the adult plumage, however it is not waterproof and is only effective when dry. Normally this is not a problem, since chicks do not enter the water at this stage. The insulation properties of the mesoptile plumage can be seen in breeding colonies during periods of hot weather when chicks often suffer from heat stress. By contrast, the breakdown of this insulation when wet is evident during periods of heavy rain, when some chicks can become saturated, and die from hypothermia. Despite these drawbacks, the mesoptile plumage provides the best possible compromise under a wide range of climatic conditions. Its development coincides with other physiological changes, which enable the chick to regulate its own body temperature without being brooded. When the chick becomes fully developed, further physiological changes occur, and the mesoptile plumage is shed and replaced by a waterproof plumage similar to that of the adults. This plumage needs to be kept waterproof in order to maintain an adequate level of insulation at sea, and in order to retain these properties, the plumage must be renewed regularly throughout adult life. This is usually performed during an annual moult, when birds come ashore for a period of 2 - 4 weeks, while old feathers are pushed out by the new ones growing from underneath. Adults suffer from greater levels of heat loss during their annual moult, as a result of the breakdown of the plumage. They are able to partially compensate for this by increasing their subcuticular fat deposits prior to moulting, which occurs during a period of intensive feeding at sea. Nevertheless adults must then come ashore to undertake the moult, since the plumage loses its waterproofing qualities during the moult, and would become waterlogged. The birds are unable to re-enter the water again until all the new feathers have grown in, and their plumage is entirely waterproof once again. Since their food is caught entirely at sea, it means that a period of fasting is required during the moult period. During normal fasting, such as during periods of incubation or brooding, penguins are able to reduce their metabolic activity in order to reduce the rate at which body fat reserves are used. However, during the moulting period they are unable to do this, since the reduced insulation resulting from losing feathers, creates a need for additional metabolic activity to maintain body temperature. Some additional energy is also required for the growth of new feathers, and proteins must be broken down to provide essential amino acids for the synthesis of the new feathers. The waterproofing qualities of the adult plumage is maintained by constant preening. A waxy substance is produced from the uropygial gland at the base of the tail, and this is spread onto the feathers during preening to maintain their waterproofing qualities. Preening also realigns the feathers, which interlock through microscopic hooks. Plumage around the eyes and head can only be preened by the feet, so penguins may often be seen preening each other around these areas. This is called allopreening, and it not only allows the preening of inaccessible areas, but also forms part of the pair bonding behaviour. Not all penguin species allopreen however. 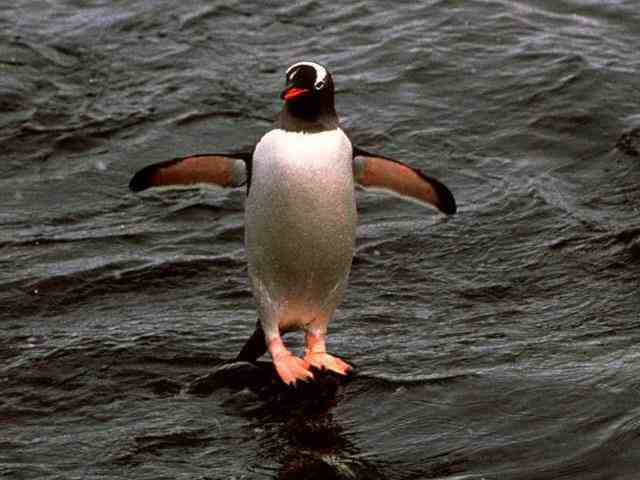 All penguins look rather ungainly on land, but in the water they are truly graceful. Evolution has made their wings small and sturdy in order to "fly" in the dense medium of water, but these adaptations have meant the loss of flight in air. In water, penguins use their flippers with much the same action as other birds do in air, using their tails and webbed feet for steering and braking. Penguins can reach speeds of up to 14km. per hour in short bursts, although half this is a more normal cruising speed. The need to breathe while swimming means that penguins often swim using a porpoising action; travelling just below the surface and periodically leaping above the surface to take short breaths without slowing. This is the quickest mode of travel, and the preferred technique of Rockhoppers and Macaronis, which can average 10km per hour for prolonged periods. An alternative technique is to travel below the surface for periods of up to 2 minutes, followed by a short surface rest of up to 30 seconds. Average speeds of up to 6km per hour can be attained using this technique, and it is the preferred mode of travel for Gentoos and Magellanics, unless pursued by predators. Penguins dive in search of prey, and then having located it they chase it, and swallow it whole under water. To locate and capture prey therefore requires good underwater vision, but the differing refractive indexes of water and air require different shaped lenses. Penguins therefore are able to alter the shape of the lens considerably, enabling them to compensate for the differences in refractive index, and allowing good vision in air and water. Penguins generally feed during daylight hours. Even at depth, sufficient light still penetrates to allow them to locate their prey, especially when searching from below where prey are silhouetted against the light from above. Even so, light at the blue-green end of the spectrum penetrates to much greater depths than reds and yellows, it is therefore unsurprising that penguin eyes are more sensitive to blue-green wavelengths. The diet of most penguins consists of varying proportions of fish, cephalopods and crustaceans, determined by variations in local abundance and by the size of prey each penguin species can swallow. Penguins also swallow small stones, and it is likely that these help in mechanically breaking up the food in the stomach. Different species of penguin favour different prey, and the depths to which they dive is related to the location of such prey. All penguins are capable of diving to depths of 100m, but the larger penguins, such as King Penguins, have been recorded diving to depths of 500m. The pressure exerted on the penguin's body increases by one atmosphere for every 10m depth, penguins therefore need a number of physiological adaptations to enable them to dive to such great depths. The main problem penguins face is being unable to breathe underwater. Having a relatively small body size compared to seals and cetaceans, penguins are more restricted in the amount of oxygen that they can store to sustain them during underwater dives. The underwater pressure compresses the air held in the lungs and air-sacs, and consequently these airways only provide about a third of the oxygen requirements needed for each dive. The haemoglobin in red blood cells holds a certain amount of oxygen in all animals, in order to circulate oxygen from the lungs to all parts of the body. In penguins, the blood has a much higher concentration of haemoglobin than is necessary solely for circulatory needs, and this is used as an oxygen store during underwater dives. In addition the muscle tissues have high concentrations of myoglobin, which also stores oxygen in the very place that it is most needed for underwater swimming. Water becomes colder with increasing depth, and during foraging dives the core body temperature of penguins can decrease substantially as a result of heat loss, and the ingestion of cold food and water. This cooling of the body core also helps to reduce the oxygen requirement during dives, by suppressing the metabolic activity of organs that are not required for foraging. As oxygen is used up during respiration, carbohydrates and fats are burned off to provide energy, and the by-product of this process is carbon dioxide. During underwater dives this carbon dioxide builds up in the blood stream due to the lack of fresh air entering the lungs and air-sacs. Under normal circumstances this excess carbon dioxide would combine with the blood to become carbonic acid, raising the acidity of the blood. Even small increases in the acidity of the blood can be metabolically damaging, and penguins therefore have an ability to buffer the blood, preventing it from becoming too acidic in the presence of increased levels of carbon dioxide. Even despite these adaptations, penguins are often unable to hold sufficient oxygen to sustain the deepest dives, and they have therefore evolved physiological adaptations that enable them to use anaerobic respiration (the production of energy in the absence of oxygen). In humans, when muscles become overworked and lack sufficient oxygen to sustain their energy requirements, the build up of lactic acid resulting from anaerobic respiration quickly causes pain and muscle fatigue. In penguins however, the muscle tissues contain high levels of an enzyme called lactate dehydrogenase which allows muscles to continue working anaerobically, by neutralising the build up of lactic acid. This lactic acid is later expelled from the body when normal breathing is resumed, during periods of surface rest or shallow diving. Penguins must all come ashore in order to breed, and the sites they choose for this vary considerably between species. Some species remain around the breeding colonies throughout the year, whilst others desert the colonies completely during the non-breeding season. The latter species generally remain at sea throughout the non-breeding season, and their foraging ranges are often difficult to determine during this period. Pre-breeding birds of most species also tend to remain at sea, except during their annual moult. Some penguin species may commence breeding when just 2 years old, while other species do not breed until 6 or more years of age In most species the males arrive at the breeding site a few days before the females, and this is due to the fact that there are more males than females. Despite popular belief, most penguins are not faithful for life, and the rules of partnership are complex. Both partners generally return to the same breeding site each year, and many species use the same actual nest, which they refurbish each season. The male usually seeks out his previous partner in order to breed with her once more, but if the female arrives at the nest site first, and cannot find her previous mate, she will quickly pair with any unattached male nearby. This makes sense, since if she delays breeding too long for a mate that may never arrive, she is likely to loose her opportunity to breed that season. It is therefore essential that the male arrives at the nest site before the female, since it is much harder for an unpaired male to find a replacement female. On occasions a female may arrive at the nest site first, and not finding her previous mate will proceed to copulate with another male, only to reform her partnership with the previous years partner when he finally appears. This leaves her unsuspecting partner to incubate and rear the offspring of another male. This is an added incentive for the male to arrive first, in order to ensure that his partner does not attempt to copulate with any other males. Pair bonding is reinforced, and new partnerships formed, by ritualised displays and nest building. Penguins display a number of behavioural rituals to display territorial defence, aggression, submission, and to enhance the pair bonding. Such rituals include head and flipper waving, bowing, presenting gifts, allopreening, and vocal calls. Aggressive postures are designed to avoid the need for physical contact, but fights do still break out within the colony during the establishment of mates and territories. Such fights can be aggressive, with birds using bills and flippers against their rival. Once brooding has begun, penguins generally defend a territory within pecking distance of their nest. Mating takes place within a few days, and most species lay two eggs at an interval of around 4 days. Breeding in colonies allows synchrony of egg laying, which in turn reduces the sustainability of eggs and young for dependent predators which are also trying to raise young. More evenly aged colonies are also easier to defend, since they offer less opportunity for predators to prey on younger chicks. Both parents take turns to incubate the eggs and care for the chicks once they have hatched. An area of skin on the lower abdomen lacks feathers, and is called the brood patch. This allows sufficient transfer of heat to eggs and small chicks as the bird lies over them in the nest. During incubation, the brood pouch becomes swollen and diffused with blood to aid heat transfer. When the birds are not incubating, the patch can be closed, so that the feathers around it join and exclude water during feeding periods at sea. Prior to hatching, the chicks call to their parents from inside the egg. The chicks use a small point on the tip of the bill, called the egg tooth, to break through the egg shell. Hatching can often be a prolonged process, lasting a couple of days. When the chicks reach about two weeks of age, the original protoptile plumage, which is thin and readily transmits warmth from the parent bird, is replaced by a thicker mesoptile plumage. This provides good insulation, and in association with metabolic changes, it allows the chick to maintain its own body temperature. This allows both parents to go to sea in search of food, in order to meet the growing demand for food from the larger chicks. In most surface-nesting species, chicks whose parents are at sea form into creches, and this provides them with a certain degree of protection from cold weather and predators. Returning adults identify their chicks by recognition of their distinctive calls. Chicks must beg for food in order to initiate a feeding response from the parent, and this is usually done by constant pecking around the parents bill. Penguins, unlike most other birds, do not have crops and regurgitate partially digested food directly from the stomach. Generally it is the adults who must be convinced that they are receiving feeding demands from their own chick, since hungry chicks will happily beg from any passing adult, or even other chicks. Mortality amongst chicks is generally quite high, and varies from species to species according to different breeding strategies. Some species lay only one egg, or lay two eggs of different size and concentrate on reliably raising the largest. Other species lay two equally sized eggs, and put equal effort into rearing both. This allows them to achieve higher reproductive success during seasons of high food abundance, but they may suffer from low reproductive rates when food is scarce. Such species tend to show higher annual fluctuations in both breeding success and population size. When chicks are ready to leave the nest site and take to the sea, they shed their mesoptile plumage and develop their adult waterproof plumage, allowing them to enter the water for the first time. The term "fledging" normally applies to the stage when young birds take their first flight from the nest, but in penguins the term refers to chicks changing into adult plumage. Some parental responsibility may still remain after fledging, but before long most adult penguins return to the sea in order to build up their body fat reserves in preparation for their annual moult. These foraging trips usually last up to about four weeks, and allow the build up of thicker layers of sub-cuticular fat, which will provide better heat insulation during the forthcoming moult. This is particularly important, since adults are unable to feed during their 2 - 4 week moult period, and must sustain heat loss by burning up body fat. If insufficient body fat exists, adults may starve to death prior to completion of their moult. In practice this very rarely happens, but it has been observed following seasons of extreme food shortage, such as following the effects of El Niño Southern Oscillations (ENSO). Healthy adult penguins have few natural predators on land, although on occasions Sea Lions have been known to come ashore to take adult penguins. At sea however, penguins are often killed by Leopard Seals, Sea Lions and Killer Whales. Skuas and gulls are regular predators of eggs and small chicks during the breeding season, but are unable to over-power healthy adults. Although all penguin species share many common features, they are also uniquely different from one another. They each occupy different types of coast, and even different regions and climates. They have different lifestyles, have adopted different life strategies, and utilise different resources. Such variations reduce direct competition between species, by allowing them to forage for different sizes or species of prey, and to utilise different nesting sites. These characteristics also give them their individuality.